A day without walking, a day without travelling. What to do, what to do? There are 1,100 restaurants and bars in this town, 80 kinds of sea fish, 50 kinds of mullusk, and 188,130 kilos of seafood sold annually...I think Dayton has a plan. We started out with coffee and churros and a few errands before we went to the Cathedral for the Pilgrims' Mass. It was rather incredible to see how many pilgrims complete this Camino every day. The Cathedral was full and a welcome was given to the pilgrims in many different languages. 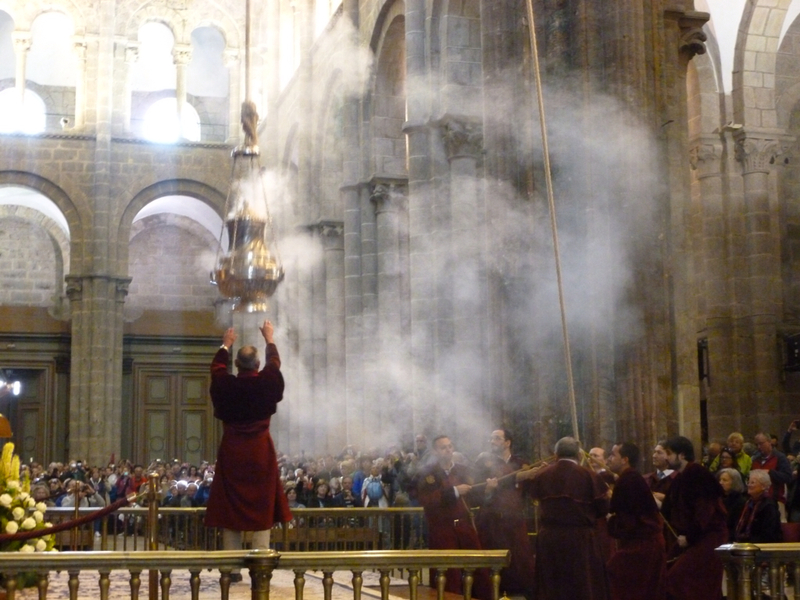 For the first time for us, during the Pilgrims' Mass, we got to see the Botafumeiro, the largest censer in the world, fly across the church. 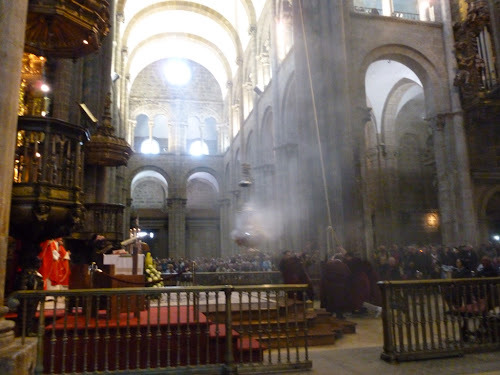 Eight men dressed in monk-style robes pulled heavily on the huge ropes to get it to swing back and forth across the church. It is said to swing at up to more than 65kms an hour as it swoops over the heads of the congregation. I was more than a little intimidated by my front row seat and a little fearful that I might be the first pilgrim crushed by it if any of those ropes ever broke. My guide information states that Botafumeiro is normally only used during religious solemnities and Holy Years and I don't know what today's occasion was but I am glad we had the chance to see this very impressive ritual. After Mass we went to the Pilgrims' Office to get a sello (stamp) for our credenciales. 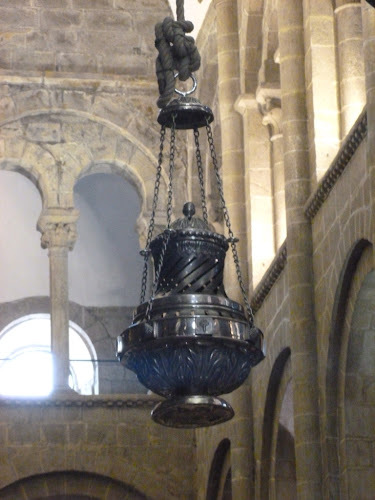 We are not eligible for a Compostela certificate this time because, even though we have walked almost a hundred kilometres more than the Camino Frances, one has to walk the last 100kms from Sarria to receive the compostella. We knew this but still I must admit it kind of made me feel like an outsider, a non-finisher, even though I know differently. When we saw all the incoming pilgrims enthusiastically greeting and congratulating one another as they came into the square. I remembered how jubilant we were four years ago when we were there to welcome our own Camino pod of fellow walkers. After a couple of tapas, we decided we had to call it an early night tonight as we will be leaving early early morning to walk to Negreira, the first of our three stages to Muxia. Time to get back into that Camino walking 'zone' or zen.